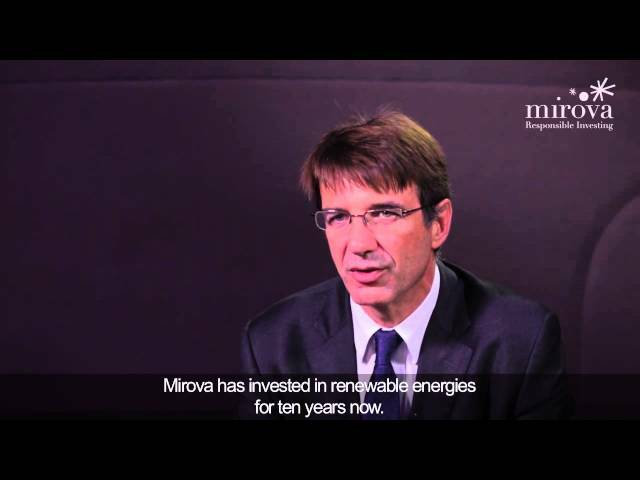 Combining value creation and sustainable development: that is the central challenge of Mirova, responsible investment division of Natixis Asset Management. In order to do this, Mirova offers a global responsible investing approach with a single offer revolving around 4 pillars: listed shares, infrastructure , impact investing , voting and engagement. “The year 2012 closed favourably for equity markets despite periodic dips due to the return of risk in the euro zone between May and June and the general elections in Greece”, explains Jens Peers, CIO Sustainable equities of Mirova, responsible investment division of Natixis Asset Management. “Within this context, Mirova equity funds outperformed their benchmarks or displayed an attractive performance for those without a benchmark”. These results arise from the implementation of an active management strategy on sustainable investment themes and/or quality stock picking of values which address sustainable development challenges or which are positively exposed to these issues with the objective of creating long-term value. “Our funds have clearly play their cards right. We can quote our Impact Funds Climate Change, ranked in the 1st quartile over one year in a universe of marketed funds for sale in France. The fund is also ranked 1 on its Regular Performance over 3 years . And the AAA Actions Agro Alimentaire fund is ranked in the 1st quartile over one year in a universe of marketed funds for sale in France ”, explains Jens Peers. /// …which thematic favouring in 2013? The outlook for thematic stocks in 2013 is apealing. Mirova experts believe that rising potential remains high on equities and that there are numerous investment themes to play, as e natural gas revolution and water. “With the objective of searching for business models capable of delivering long-term performance, the Mirova investment team will target companies which not only benefit from these trends, but also have solid balance sheets”, underlines Jens Peers. "After a positive 2012, which investment themes to favour in 2013?" This information is intended for professional clients. The risks and relative fees involved with this investment are detailed in the fund’s simplified prospectus. There are no guarantees when it comes to the capital invested or to performance. Please read the prospectus/key investor information document carefully before investing. The prospectus and periodic documents are available from Natixis Asset Management on request.